In the holiday special, Grady and Sonny play parents to Zora who got excited when she found out that she gets a life-size Joe Jonas as a Christmas present. Disney Channel’s “Sonny with a Chance” cast made use of the Thanksgiving holiday to greet fans with a video and share a sneak peek to the upcoming episode. Called “A So Random! 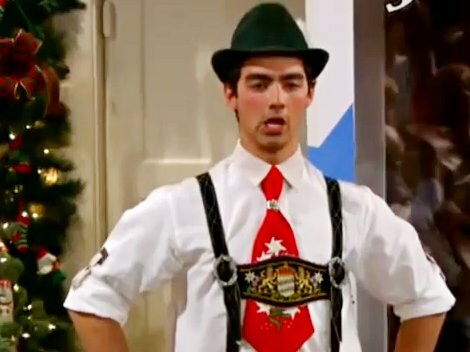 Holiday Special”, the special episode features Joe Jonas who plays himself and appears as a Christmas present that comes in a box and with accessory. Chad Dylan Cooper hosts the fully-produced, jolly-themed “So Random!” holiday special. Sketches include “A Jonas for Christmas,” “The 12 Days of Sickmas with Sicky Vicky,” “Holiday Cooking with Roadkill McGill” and “Christmas with the Real Princesses of New Jersey”. Joe Jonas would also be the musical guest of the night, singing a duet with Demi Lovato by the piano. The November 28 episode had been shot before Lovato admitted herself to rehab earlier this month. The cast are due to be back on the set to resume the production in January but since Lovato is not immediately available, they would do sketches like this holiday special, using “So Random!”.